Background: There is a growing demand for mass production of shikalkin (a natural pigment consisted of shikonin and alkannin) due to its increasing applications in cosmetics, pharmaceutical and nutrition industries. The root of Iranian Arnebia euchroma produces shikalkin. The promising capability of this plant for shikalkin production has already been demonstrated in cell culture studies. Objectives: Elicitation effect of Rhizoctonia solani (R. solani) in comparison with the effects of Cu2+, methyl jasmonate (MJ), and salicylic acid (SA) on the shikalkin production was investigated in A. euchroma callus. Materials and Methods: The calli from different origins (leaf, collar and root) were proliferated on a modified Linsmaier-Skoog (mLS) medium and were subsequently transferred onto the pigment production medium containing various amounts of the desirable elicitor. Observations were quantified and the pigment production was precisely measured spectrophotometrically. Results: Pigment biosynthesis was induced on White medium containing IAA (1 mM) and kinetin (10 mM) in dark at 25°C. Use of R. solani increased the pigment production by 7 fold greater than normal White medium. Cu2+ only doubled the shikalkin production. MJ and SA showed enhancing effects comparable to that of Cu2+. Discussions: It is assumed that upon binding of the polysaccharides of the fungal cells to the plant cell surface, a cascade of signaling is initiated that led to expression of genes involving in the biosynthesis of shikalkin. Shikalkin is a mixture of shikonin (S-enantiomer) and alkannin (R-enantiomer), Figure 1. They are usually biosynthesized along with their esters in the plant cells of some members of Boraginaceae (1). In addition to A. euchroma, shikalkin is found in some other genus of Boraginaceae such as Lithospermum, Alkanna and Onosma (2). Shikonin was the first plant secondary metabolite, which was produced in commercial scale by the cell culture of Lithospermum erythrorhizon (1). The demand for the large scale production of shikalkin is increasing due to its attractive color and pharmaceutical properties (3, 4). The number of the research papers on the medicinal properties of shikalkin is growing and no toxicity has been reported for the use of the pigment (5-8). Although a great deal of information about the biosynthesis and mass production of shikalkin comes from L. erythrorhizon cell culture studies, it has been shown that the A. euchroma cells are similarly capable of shikalkin production (9). p-Hydroxybenzoic acid (PHB), derived from the phenylpropanoid pathway, and geranyl-pyrophosphate (GPP), from the mevalonic acid pathway, join together under the effect of PHB-geranyl transferase to initiate shikalkin biosynthesis (Figure 1). Phenylalanine lyase (PAL) and 3-hydroxy-3-methyl-glutaryl-CoA reductase (HMGR) play key roles in the shikalkin pathway (10). Light, ammonium and 2,4-dichlorophenoxyacetic acid (2,4-D) inhibit the shikalkin formation while 3-indoleacetic acid (IAA) and copper ion (Cu2+) induce its biosynthesis (11). In vitro production of shikalkin is accomplished through a two-stage plan including proliferation and production steps. In the first step, the plant cells are proliferated on a growth medium such as Linsmaier-Skoog (LS) containing 2,4-D and N-(2-furanylmethyl)-1H-purin-6-amine (kinetin). In the second step, the cells are transferred to a production medium such as White medium containing IAA and kinetin. The whole process is carried out in the darkness at 25°C (12-15). Elicitors are compounds that in low concentrations enhance secondary metabolite production (16). The advantage of using elicitors for shikalkin production has been demonstrated. For instance, the effect of oligogalactoronides, methyl jasmonate (MJ) and stresses caused by gama radiation and ultrasonic waves on L. erythrorhizon culture have been studied (17-20). The positive effects of fungal elicitors such as Aspergillus niger and Rhizopus oryzae and some micro-elements such as Cu2+ in the cell cultures of A. euchroma have also been demonstrated (12, 21). In pursuit of these studies, the effects of MJ, salicylic acid (SA) and the extract of R. solani (a plant fungal pathogen) on the pigment production were examined in callus of Iranian A. euchroma. Kinetin, 2,4-dichlorophenoxyacetic acid (2,4-D), 3-indoleacetic acid (IAA), MJ and SA were purchased from SigmaTM Chemical and Biochemical Company (St. Louis, MO, USA). All other chemicals were taken from the authentic samples. Solid Murashige-Skoog (MS), LS and White media were prepared according to the literature using 8 g.L-1 agar (12). Modified LS (mLS) was made according to our previous work (9). A. euchroma specimens were collected and determined as described earlier (9). Seed germination and callus induction were successfully carried out according to the reported method (14). The resulting calli from leaf, collar and root explants, obtained from young plantlets, were propagated first on MS medium supplemented with sucrose (50 g.L-1), 2,4-D (10-6 M), and kinetin (10-5 M) during three successive subcultures at 25°C in darkness. The propagation medium was then changed from MS to mLS for another three successive subcultures. Subcultures were carried out every three weeks. To calculate the biomass, the weights of the calli were recorded before and after drying at 37°C for 48 h.
The stock solutions of MJ and SA were made by dissolving the desirable amount of the elicitor in 96% (v/v) ethanol (EtOH). The resulting solutions were stored at 4°C. Fungus pathogen, R. solani was procured from University of Tehran Microbes Collection (UTMC). R. solani was propagated in YES medium [50 mL of sucrose (150 g.L-1), yeast extract (20 g.L-1), MgSO4.7H2O (0.5 g.L-1), CuSO4.5H2O (0.005 g.L-1) and ZnSO4.7H2O (0.01 g.L-1)] (15) in a flask (250 mL). The flask was shaken (100 rpm) in dark at 25°C for 5 days. The biomass was filtered, autoclaved and dried through two successive stages (70°C for 48 h and 37°C for 4 days). The dried biomass was powdered and stored at 4°C. The proliferated plant callus was transferred on White medium containing IAA (1 mM), kinetin (10 mM) and 8% (w/v) agar to initiate pigment production. Shikalkin formation was investigated on White media containing various amounts (0, 0.25, 0.5, 1 and 2 mM) of MJ and SA. To study the effect of the fungal elicitor, White media containing (10, 20, 40 and 80 mg.L-1) of the R. solani powder were used in the experiments. To examine the effect of the solvent (ethanol), the pigment production on White media containing (0, 4.25, 8.5, 17 and 34 mM) of EtOH was also examined. White medium and a White medium containing copper ion (0.3 mg.L-1) were considered as the control and positive control media, respectively. The callus sample was taken from the solid medium, was removed from cells and dried at 37°C for 48 h. The callus was powdered and subjected to extraction by radical-free tetrahydrofuran (THF) (11). Extraction was carried out at room temperature by stirring the powder in THF for 10 min. Concentration of the pigment in THF was determined spectrophotometrically by reading the absorbance at 520 nm (11). A calibration plot, obtained for the shikalkin pigment extracted from the natural root of Iranian A. euchroma, was used in calculations. Spectrophotometric measurements were carried out using an Analytik, Specord 210 (Jenna, Germany) spectrophotometer. Results for all the culture studies and the pigment measurements were based on an average of, at least, triplicate measurements. A. euchroma seeds (23%) germinated on hormone-free MS medium. The first and the last seeds germinated on the 4th and 57th day of the experiment, respectively. Callus induction was successfully occurred for all collar, leaf and root explants on MS medium containing kinetin (10 mM) and 2,4-D (1 mM). The first callus induction was observed on the 7th day and the last one on the day of 15. Biomass development accomplished through three subcultures. The callus from the collar origin showed the highest proliferation rate (Table 1). In parallel to the previous observations (9), the best results were belonged to the calli propagated on mLS medium containing kinetin (10 mM) and 2,4-D (1 mM). After transferring the propagated calli onto the designed production media, the observations and results were analyzed both qualitatively and quantitatively. White was used as the basal medium throughout these experiments with the hormonal treatment of IAA (1 mM) and kinetin (10 mM). The appearance of the red color in the callus was considered as a positive response (Figure 2A). Based on this assumption, the number of petri dishes with positive responses was counted and used for qualitative analysis. The THF extract of the pigmented callus produced the characteristic visible spectrum of shikalkin (Figure 2B) (9). Regardless of type and concentration of the added elicitor or EtOH, the number of Petri dishes with positive responses was counted at the end of each subculture and analyzed based on the origins of the calli (Figure 3). This analysis indicated that the calli originated from the leaf explants were able to produce about 50% positive responses at the end of the first subculture. Only 2% of the non-pigmented calli could produce shikalkin in the second subculture and there was no more positive response by the end of the third subculture. A similar result was obtained for the calli from the root origin. They produced 40%, 20%, and 0% positive responses at successive rounds of subcultures. In contrast, the calli obtained from the collar explants were able to produce shikalkin even in the third subculture. They showed positive responses of 48%, 12%, and 23% (83% altogether) at the end of each subculture (Figure 3). Similar analysis to what was introduced in the previous section was repeated, but this time with regard to the type and concentrations of the elicitors and EtOH. These analyses were summarized in Figures 4 and 5. EtOH had a decreasing effect on the advent of the positive answers, Figure 4. The highest number of positive responses was obtained from the collar callus when it was subcultured on White medium in the presence of the fungal elicitor (40 mg.L-1). The second and the third rank or pigment production were also belonged to the collar in the presence of MJ (1 mM) and SA (0.5 mM), respectively (Figure 5). Experiments were repeated with the collar-calli in the presence of various elicitors under the conditions, which had produced the largest amounts of shikalkin. Similar calli were simultaneously subcultured on normal White (control) and White medium containing 0.3 mg.L-1 of Cu2+ (positive control) (Figure 6). Quantitative analysis of the results was accomplished by measuring the amount of the extracted pigment per gram of the dried biomass. Figure 7 illustrates the analysis of the shikalkin production data obtained from the subculture of A. euchroma callus with the collar origin under the conditions that had produced the highest responses for each elicitor. Callus induction in all explants of Iranian A. euchroma in a short period (7-15 days) revealed the potential of this species for in vitro cell culture. Root and leaf callus induction of Himalayan A. euchroma needed 16 and 20 days, respectively (23). The number of positive responses (petri containing a callus with red pigment) reveals the biosynthetic potential of the cells with different origins under the applied conditions. Here and in respect to shikalkin production, two remarkable points need to be mentioned. First, the calli from different origins showed different biosynthetic capabilities. Among the examined calli, only the collar-originated callus was able to produce shikalkin over three successive subcultures. Second, the collar originated-callus had also the highest propagation rate. Similar observations have been reported by others (24-25). In view of the results of their research on taxol production in the Taxus suspension cultures, Kim et al. (2004) concluded that cells with high division rate and biomass development at the proliferation stage under the effect of elicitors could produce higher secondary metabolites at the production stage (24). However, it is not a general rule. For instance, in cell suspension cultures of Ginkgo biloba, MJ treatments increased the amounts of bilobalide, ginkgolide A, and ginkgolide B, concomitant with a slight decrease in the cell growth (25). As mentioned, EtOH was used as a co-solvent for MJ and SA. Figure 4 clearly shows that EtOH reduced the incident of red pigment formation in the calli. In other words, EtOH had inhibitory effect on the shikalkin production. Tabata et al. (1974) reported similar observations from the studies on shikalkin production in L. erythrorhizon (20). It seems that the collar-originated callus was more sensitive to EtOH so that no pigment production was observed by this type of callus when the EtOH concentration was raised to 34 mM, while the other calli were still producing some shikalkin (Figure 4). MJ. The role of jasmonate and its derivatives as signaling molecules in response to environmental stresses have been studied (26). According to Yazaki et al. (1997) MJ increases shikalkin production through activating PHB-geranyltransferase (20). This enzyme synthesizes m-geranyl p-hydroxy benzoate (Figure 1). Here, the collar originated callus strongly responded to this elicitor. At the optimal concentration of MJ (1 mM), the number of collar-calli plates with positive responses was seven times higher than the other calli (Figure 5). Enhancing effect of MJ on biosynthesis of naphthoquinonic metabolites has been reported. In the root culture of Impatiens balsamina, MJ (0.4 mM) increased the production of lawsone and lawsone methylether (naphthoquinonic metabolites) by 6.8 and 11.3 times, respectively (27). SA. This molecule is recognized as a phytohormone that takes part in higher plants defense responses also known as Systemic Acquired Response (SAR). SA activates signaling pathways that cause secondary metabolite production in plant cultures (28). For instance, application of SA (1 mM) in the culture of Ginkgo biloba resulted in an increase of 3.1 and 6.1 times in the gingkolide A and ginkgolide B production, respectively (25). The results illustrated in Figure 5 indicate that SA was able to influence the production capacity of all kinds of A. euchroma calli. However, stronger responses were belonged to the collar originated calli. This observation corroborates the higher biosynthetic ability of the collar originated callus as compared with the other examined calli. R. solani. It is assumed that the elicitation ability of the fungal elicitors is related to the polysaccharide components of their cell walls (29-31). Upon binding of these polysaccharides to a plant cell surface, a cascade of signaling is initiated that leads to expression of genes involved in secondary metabolite production (32). For instance, it has been demonstrated that PAL is activated in the presence of the cell wall fragments of yeast fungal elicitor (33). PAL converts phenylalanine to cinnamic acid, an important precursor in the shikalkin pathway (Figure 1) (10). In this research, the highest amount of pigment production was observed in the presence of R. solani (40 mg.L-1) and the best result was belonged to the collar-originated callus (Figure 5). Copper ion works as an abiotic elicitor on the shikalkin biosynthesis, however the mechanism of its action has not yet been clearly explained (34, 35). The pigment production by the collar originated callus on White media containing effective concentrations of MJ, SA, and R. solani revealed that R. solani and Cu2+ had similar enhancing effects on the number of the plates with positive responses (Figure 6). In contrast, MJ and SA had about 10% reducing effects as compared with the results observed for normal White medium, presumably due to the inhibiting effect of the co-solvent (EtOH). However, it should be noted that the enhancing effects of SA and MJ were modified by the co-solvent, EtOH. 2. Bagheri S, Sanjarian F, Haghbeen K, EbrahimiI MA. Establishment of cell suspention culture from Onosma dasytrichum seed callus culture. Int. Res J Appl Basic Sci. 2011;2(10):392-397. 6. Dhandapani R, Sarkar AK. Antibacterial activity and UV property of shikonin on silk substrate. J Textile and Apparel, Technology and Management. 2007;5(4):1-7. 9. Haghbeen K, Pourmolaei S, Mareftjo M, Mousavi A, Akbari Noghabi K, Hosseini Shirazi F, et al. 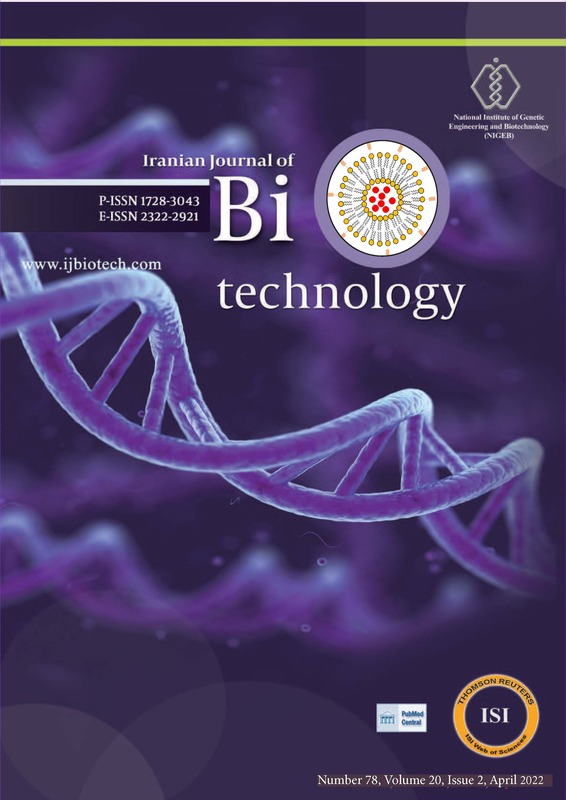 Detailed investigations on the solid cell culture and antimicrobial activities of the Iranian Arnebia euchroma. BioMed Research International. 16. Namdeo A. Plant cell elicitation for production of secondary metabolites: a review. Pharmacognosy Reviews. 2007;1(1):69-79. 22. Blazier SR, Conway KE, Characterization of Rhizoctonia solani isolates associated with patch diseases on turfgrass. Proc. Okla. Acad. Sci. 2004;84: 41-51.